Fitness classes are an awesome way to stay in shape and are perfect for those who need some #fitspo — whether you’re a newbie or just in a workout routine rut. But if you’re tired of the same old yoga or Pilates classes and are itching to try something new, you might want to walk on the more exotic side of exercise and try out a new fitness class that will really get your heart pumping — and better yet, why not try one of these workout classes with your friends? Summer is the perfect time to try out a new fitness class with your friends — you can bond, hang out, and get your sweat on. Plus, more than anything, you’ll probably have a decent LOL session as you shake, shimmy, and swim. 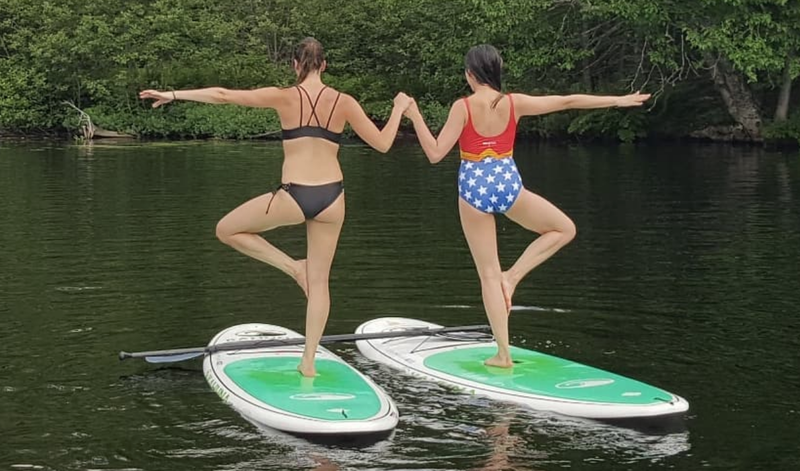 From pole dancing to mermaid swim classes, there are a slew of unique fitness classes to try with your squad this summer. The hula hoop doesn’t have to be a thing of your childhood past. In fact, the hula hoop has been popping up in tons of workouts, from CrossFit to Powerhoop, where participants work with a weighted hula hoop. There are a number of hula hoop classes and workshops out there, so if you want to work on your waist, balance, and core, you should definitely google a hula class in your area. Everyone wants to be a mermaid and be “a part of their world,” right? Now you can channel your inner Ariel and learn how to swim using a mermaid tail. In these unique aquat-fit classes, you typically learn synchronized swimming techniques as you challenge your arms and legs. Working up a sweat as your work the pole has been a popular fitness choice in Hollywood and beyond for a number of years. Not only do these classes make you feel empowered and more alive in your body, but you’ll also master balancing and dancing in heels. Always dreamed of joining the circus but didn’t want to commit to, like, actually running away? Now you can feel like a legit acrobat with aerial circus classes where you can master balance and strength as you challenge yourself — and gravity — using hoops, bands, and ropes. Trampolining has been trending lately, and for good reason. It’s a low-impact cardio exercise that’s easy on the joints but also really gets your heart pumping. It’s also said to be beneficial for your lymphatic system, which helps drain unwanted toxins from your body. Want to change up your yoga routine but are still dedicated to your practice? Then paddleboard yoga just might be what you’re looking for. The yoga classes take place on a paddleboard or surfboard where you can work on your strength and balance in a new and challenging way. Don’t worry if you’ve never surfed before — while some classes take place in the water, others are on solid ground. Changing up your fitness routine is always a good idea. You challenge your body and mind, which helps to increase strength and muscle tone, and might even snap you out of a plateau. No matter what, you are sure to learn and laugh a lot — especially if you take a workout class with friends. So go sweat it out.